THIS is one of the things I was interested in the most since EP7 started – exactly how they were going to handle Van Dine rules. The first time it was used was with “the culprit cannot be a servant” which with it Will makes his appearance with and strongly objects to SSVD’s brutal methods. Later he mentions how there must be a body in order for it to be crime and of course how clues must be PRESENT in order for the mystery to make sense. As we can gather there are ways to get around the Rules. There were methods to get around Knox this was shown in EP5 by Battler therefore it wouldn’t be inconceivable to come to the conclusion there could also be ways to get around Van Dine’s rules. Willard was able to (implied and believed) solve Beatrice’s riddles from EP1-EP4 and thus we assume he found the truth. He came back because he couldn’t let the following game that was shown that depicted this sort of truth that Bernkastel showed to be real. The gist of it is Willard stays behind so Leon can escape. 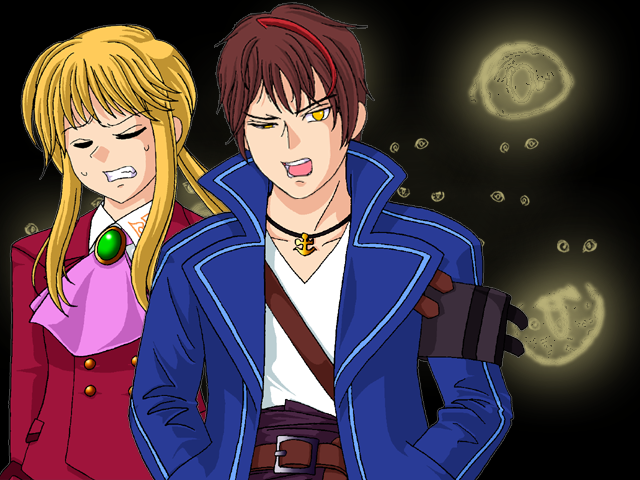 Will fights Bernkastel. Leon keeps running until she gives up, Leon appears and saves her. They’re both destroyed by Bernkastel in the end. Before this Will was already beaten up badly, having lost even an arm in the battle but he catches up to Leon then later both of them devoured by cats. There are two ways to go about it with Van Dine Rules after this. Will was utterly defeated by Bernkastel. She was able to counter all Van Dine’s rules in her own way. Bernkastel’s approach to the story has a great deal of the time been mystery related therefore I gather she didn’t resort to the Fantasy argument to defeat Will. In fact she makes fun of Will’s attempt to disqualified what Bernkastel showed him (though she wasn’t the GM as she claimed) because he viewed it be fantasy because the *evidence* was destroyed (because of the bomb) and call it Fantasy rather than a mystery. I still think Bernkastel would find it more interesting to end it as a mystery as it could provide the *best* outcome for her. Will on the other hand denies it because he finds this truth to be false. What we can come to assume based on Will’s defeat is that in truth Van Dine rules had plenty of loopholes and weren’t as mighty as Will thought. Bernkastel being a far more powerful boss outdid Will and defeated him. Will stuck to disproving that it wasn’t a mystery but fantasy. Bernkastel showed him that it was indeed a Mystery. Consequently we could also reserved their fantasy and mystery claim and Van Dine’s rules would still lose to Bernkastel’s approach. Lastly, Will then realized that if he stayed he was going to be destroyed by Bernkastel no matter what and after that she would also get Leon thus why he decides that running away is the best choice thus what happens next. A more positive take on it. 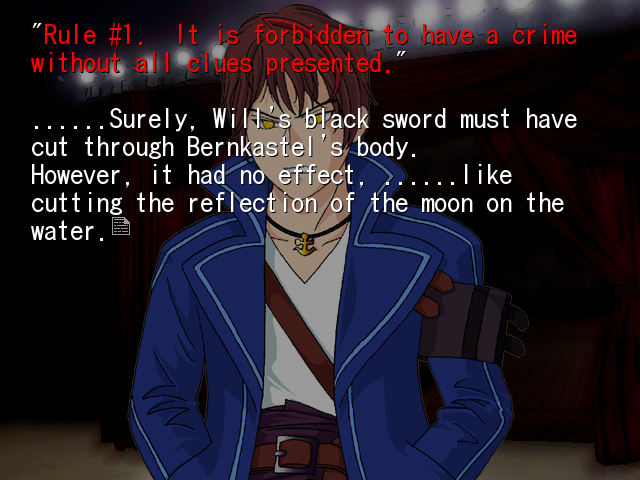 Will fought Bernkastel with the 20 stakes of his (which we’ve seen only a few). He was aware of the several loopholes in the Rules but it was the only way to buy time for Leon. For most part he was able to hold Bernkastel off but Bernkastel proved to be far superior than him. The is the same for scenarios. A couple of Van Dine rules were effective but others weren’t. We can see the fact that Will has even lost as arm that Bernkastel has been considerably destroying most of his claims even though he had previously *solved* Beatrice’s mystery. Let’s point out that Bernkastel doesn’t appear to have even broken a sweat. Will never intended to win from the start because he knew he couldn’t possibly defeat Bernkastel (whether this is due to a the fact that a furniture < Witch isn’t known but I doubt it has anything to do with it) Will considered both the fact he was eventually going to lose and the thought that Leon was going to give up (which he was right) therefore he went for her for those two reasons – the first that he was being overwhelmed meaning Van Dine rules weren’t as *effective* as he thought. The outcome is what we see. Why? This is because otherwise he could’ve put an end to Bernkastel right there and there’d be no reason to worry about Leon. And the second is that he knew that he had to be there to save Leon as eventually she was also going to be overwhelmed same as him. Conclusion – the second scenario is more likely. The fact remains that Van Dine rules aren’t as powerful as implied. Bernkastel defeating Will is a blow to Van Dine’s rules. Umineko however doesn’t go into detail of the type of counters existed to disproved these rules. 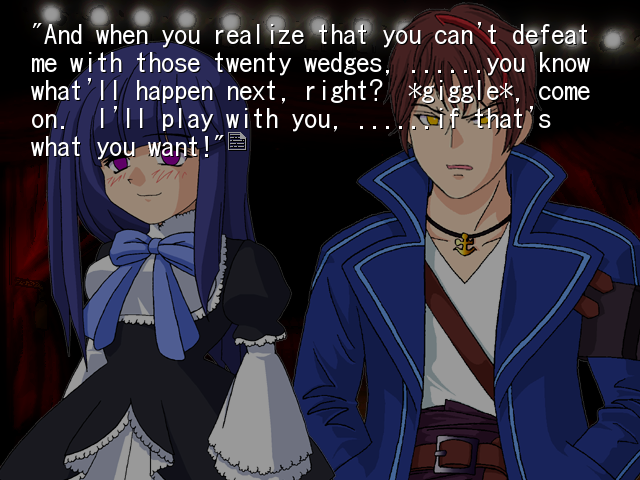 It is however worth mentioning that Will hadn’t been completely defeated yet therefore it is likely he still had a couple more wedges to go, this is corroborated by the fact that Bernkastel advises Will to draw his sword again so he could fight continue fighting her. 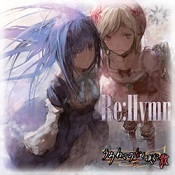 This entry was posted in General overview and tagged 100% patch, Bernkastel, EP 7, Leon, S.S. Van Dine, umineko, Umineko Requiem, Willard H. Wright. Bookmark the permalink. There is an alternative idea, that the concept of ‘stating the rules in red’ is itself flawed. Assuming the next two phrases are spoken in red, not the difference. The difference is small, but possibly significant. In the former, you are stating the rule in red. But in actuality, the only thing he is confirming is “what the rule says”. The way this red would be ineffective is if he lied about what Rule 1 really was. The latter, however, is a proclaimation. It is saying, in red, what is impossible. It is not merely stating a rule. If a rule is stated as such in red, it can still apply or not apply to any given situation: it’s as useless as the white text. then they say “of course this applies to – ” or “this refers to – ” in white text but not always stated in the full red claim. I’d say that “consistency” is the biggest factor here. I’ll mention Knox first to get to Van Dine rules. I’d like to say that they could apply from EP2-EP6. EP1 we don’t know how much of a mystery it was so everything I may say about EP1 is to be taken with a grain of salt. Personally, I still think that Beatrice’s game follows in great part Knox’s rules since based on what the game tell us it’s that Beatrice follows the Golden Age rules – loopholes still existing. However these rules by Knox are only introduced in EP5 with the appearance of Knox A. Knox. It’s highly implied that EP 6 also follows the commandments with some possible exceptions. The GM, Battler, himself uses some of them, thus proving he should be upholding to them for most part. Still no Van Dine rules are ever mentioned. Beatrice’s character has changed a lot since the game started but it has become clear from the beginning she wanted Battler to solve it, therefore a certain consistency should exist within her games for anyone to solve them. Battler was able to beat Beatrice by the end of EP4 but we’re told that he really didn’t solve it, and it was more like Beatrice let him win. Battler was finally able to solve Beatrice’s riddle by the end of EP5, the same EP in which Knox was introduced first. At this point in time Van Dine rules were never mentioned by anyone. The logical assumption would be that Battler didn’t use them to solve Beatrice’s riddle. Funny note, despite the fact the Battler did read a lot mystery novels (according to the game) he was oblivious to Knox’s rules and so highly possible that he did not know of Van Dine rules either. I don’t buy the idea that he could know Van Dine but *not* Knox. Wouldn’t that be illogical? EP2-EP4 (possibly EP1 too) – relied on Knox’s rules. Battler didn’t know of them therefore why he had trouble solving them. Nothing about any rules applying to any of these games are ever mentioned. EP5 – Lambdadelta’s Game is a bit different but she claims she is following Beatrice’s game. Knox is introduced. Battler solves the riddle by the end of EP5. Here it’s highly implied that these rules were followed for most part and were the ones that finally gave Battler that final push to help him solve the riddle. EP 6 – Battler’s game. He claims he follows Beatrice’s game (and call it a rehash). It’s implied he tried to follow Knox’s rules after understanding them so we assume he did. However, I’d like to point out (unless I’m wrong) that Battler *broke* Van Dine Rule #7 where they “demand to be a corpse for it to be a crime.” As we know Battler’s game didn’t initially involve anybody being murdered until “Erika” carried out the first twilight. This makes us doubt that Battler knew of any other rules besides Knox, it also tells us that the truth he found didn’t need anything other than Knox. a) was fully aware of Van Dine rules (imo doubtful) and deliberately broke them. b) He had no knowledge of them therefore they weren’t mandatory to solve the past games. The last argument of this is that Will was able to solve Beatrice’s games from EP1-EP4 using Van Dine rules (likely Knox’s also) to aid him. We theorize that Will found a number of Van Dine rules to be effective. Would Van Dine rules apply to all games or EP7 only? According to evidence. Knox is the one being more followed more than Van Dine rules, which were never mentioned before. In conclusion Van Dine rules weren’t “required” for Beatrice’s games from the start, they were more like a “bonus”, the key word here is “required” because only a few of those “20 rules” might apply to ALL games while others don’t. This ties back to Will being defeated by Bernkastel in EP7 showing us that Van Dine rules aren’t as powerful one could image. “Personally”, I think that Van Dine Rules “Should” be followed for most part and not be followed when it conflicts too much with Umineko’s magic/mystery/story theme. How we decide which ones apply and which one don’t, are to be measure according to what we perceive as “Mandatory” vs “Optional” rules. One thing you should probably take note of is that twice, Will mentions that he knows full well he is going to die. First, he shouts “I am Willard H.Wright inquisitor of heresy. This is the last time I’ll draw my sword!” understanding that he will die. The second time is right after that, when he tells Lion that Diana only drinks a certain type of milk. He knew full well that his rules wouldn’t work. In fact, there is a chance that Bern’s truth IS the truth he discovered, but he was trying to shut it inside the box to save Lion. Bern even called him out saying he was doing that. It should be noted that in one of Van Dine’s novels, the detective, Vance, does something similar. He knows what the truth is, but tries to deny it to save the innocent. Another point I’d like to raise is that I think that Will and Lion survived. Note that Will was perfectly confident despite losing one arm and Bern specifically stated that she did not wish them to be killed, but just taken out of the gameboard. Not just that, but remember that she waited until Will left the chapel to start the tea party. That means she feared him to a degree. And she kept giving him the option to escape instead of killing him. Why is that? I consider that while she did have the upperhand in the fight in that Will couldn’t deny her truth(anti-mystery, anti-fantasy), she couldn’t deny his truth(pro-mystery) either. I am fairly certain that Will and Lion will show up in episode 8. Van Dine isn’t that weak. Vance would laugh at the idea that Van Dine would lose to a mere witch. So yeah, I’m fairly sure that Will and Lion actually DID manage to escape at the end of the game.